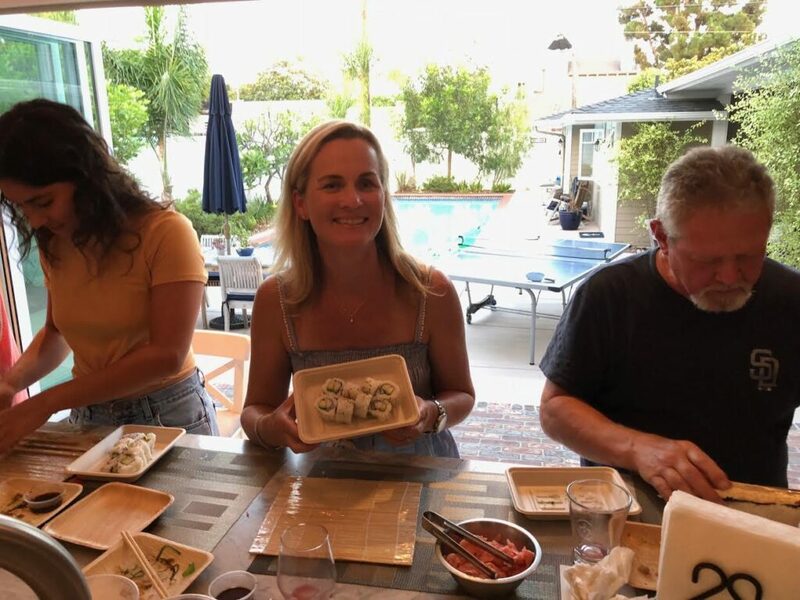 Chef Jeff teaching four Coronado couples about sushi – how to prepare it, plate it and of course, how to eat it. Being the winning bid on a “sushi dinner for 8” (courtesy of the Coronado Tennis Center benefit) was more than just another good meal. 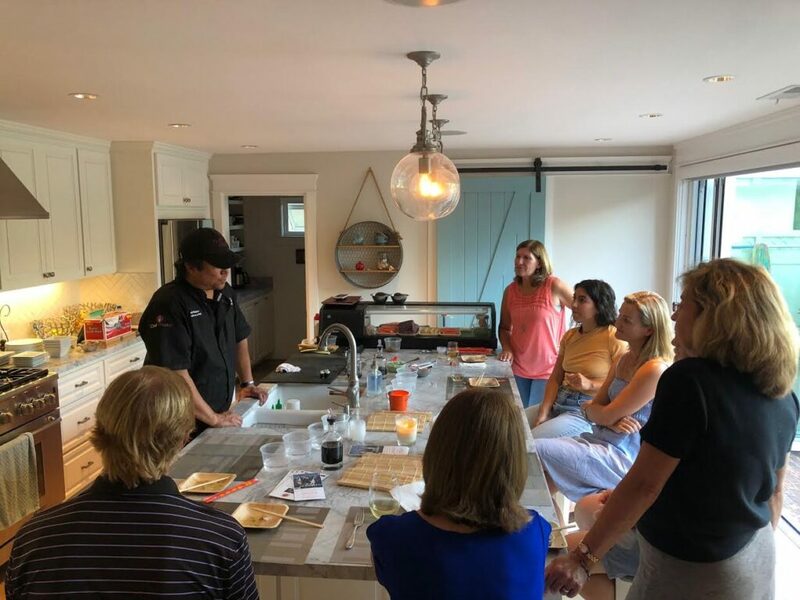 It was the opportunity for “Coronado alley neighbors” to get together to enjoy food, fellowship and the instruction of sushi-mamost talented sushi master chef, Jeff Roberto, owner of Sushi on a Roll. The Coronado Times asked Chef Jeff some questions to learn more about his “sushi story.” Whether you are new to sushi or have been enjoying it for decades, you need to enjoy a sushi class, catered event or a sit down in his sushi bar located in the shadow of the Coronado bridge (1620 National Ave, San Diego, CA 92113). How did you make your way to San Diego? I was born South Carolina, but moved to San Diego when I was three years old. A Navy family – enough said. What inspired you to become a chef with a focus on sushi? I started getting trained right out of high school. My good friend/manager, Berne Herrera, hired a couple of my friends and I was third to train as a sushi chef. There were only seven sushi bars in San Diego at this time. Honestly, it started out as just having fun at work. Friends from high school worked along with me. Passion came later, once I had a better understanding of the Japanese culture and tradition. When did you start your business, Sushi on a Roll? 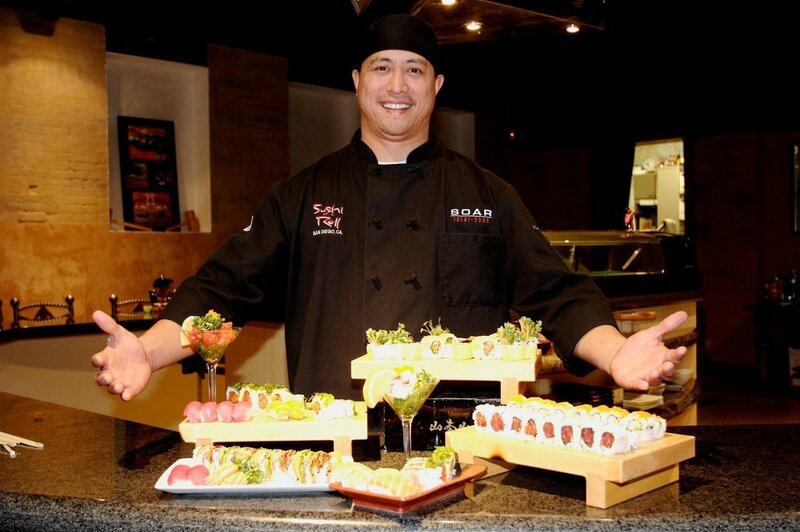 I started Sushi on a Roll on Feb 15, 1993 with my best friend, Michael Reyes. Five years later, I bought him out and have been the sole owner since. I’ve been doing this for over 25 years and that is definitely the biggest accomplishment. However, I have catered to many well-known personalities over the years: President Clinton, Vice President Joe Biden, Angelina Jolie, Jamie Foxx, Jim Carey, Elizabeth Towne and Orlando Bloom to name a few. I have also provided sushi for the MTV Awards, Teen Choice Awards and Comedy Central Awards. I’ve spent many years at SONY studios, LA Studios and Fox Studios serving “hollywood” sushi. During one Super Bowl week, we did 55,000+ pieces of sushi! At a Qualcomm 25th anniversary, we did 43,000 pieces in one day with 29 sushi chefs! A very happy Coronado resident, Lisa Johnson, shows off the first sushi roll she ever made. 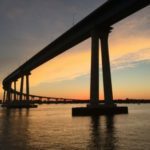 Can you share where you have done business in Coronado? The Hotel del Coronado hired Sushi on a Roll – they were my second client. For many years, we have made sushi for the Coronado Marriott and Loews Coronado. Of course, we cater many private events here in Coronado. Where does your product come from – how fresh is it? We get product from a couple of mongers in SD, Catalina Offshore and SD Seafood. Otherwise most sushi bars get product from the Japanese vendors in LA. Our product is very fresh as we go through product daily and especially since we serve so many groups. Favorite sushi dishes to serve? Speaking traditionally, I would pick sashimi/nigiri. This sushi gives you one flavor and the fish has to stand alone while others will use sauces to “mask” older fish. This is a lost art with most sushi bars. What services do you offer? Classes, catering, restaurant? When you aren’t slicing, where do you go for the best sushi in San Diego? The best is Sushi Ota – very traditional. Many of my friends operate wonderful sushi bars. Some include: Siako Sushi, / Azuki / Mr. Sushi / Taka and the Fish Market. Where can they enjoy sushi for you to prepare? In addition, we just bought a Japanese grocery store / sushi take out in National City – check it out!